In case you missed it, the brand new series of Doctor Who premiered last night. New series, new show runner, and new doctor! It’s a big episode for this show. Be warned there are major plot spoilers ahead! Proceed at your own risk. I have really high expectations for this episode, and this season, but I am willing to give this season some runway room to succeed. It may take a few episodes for the show to really find its stride again. We’ll see how the first female doctor stands up against almost 60 years of history. So, let’s dive in to episode 1, The Woman Who Fell to Earth. 19 year old Ryan Sinclair is filming a YouTube video about the greatest woman he ever met. She is brave, and kind, and wonderful, and Ryan is ready to tell the world all about her. Starting with a story about a bike. Even at 19, Ryan still hasn’t learned to ride a bike. Much to his chagrin, it’s nearly impossible for him to pick up after all these years. Even with the help of his grandmother and step-grandfather coaching him along, the feat is near impossible. It doesn’t help, mentions his grandmother, Grace, that his dyspraxia – a coordination disorder- makes it that much more difficult. In a rage, Ryan throws his bike over the cliffside and into the trees below. After briefly relishing in his moment of victory, he knows he must climb down and retrieve his bike. His grandparents leave him to it as they have to catch the last train back into town. On his hike down the hillside, Ryan discovers a strange group of glowing lights. They shift and move as he comes near and he reaches out to touch them. As his fingertips brush against the lights, they release a blast of energy and disappear. In their place is a pulsating orb that is freezing to the touch and impossible to move. Ryan, with a good sense of danger decides to call the police. The police officer who answers Ryan’s call is none other than an old classmate of his named Yasmin. She is a young officer that is searching for a bit of excitement beyond the odd traffic stop. Together, the two investigate the orb further, trying to figure out where it came from when Ryan gets a call from his grandmother Grace. Something has happened on their train home and they’re in trouble. Grace and her second husband Graham are now stranded and locked in a train that’s under attack. Something broke through the front of the train and began attacking the train cars. A bizarre wiry, tentacle monster (think live action Tangela) threatens everyone aboard. Thankfully, at just the right time, a woman comes crashing down out of the sky and into their train car. Quickly regaining her feet, the woman fends off the monster and saves the people aboard the train. Yaz and Ryan have shown up just in time to watch her save the day. The Doctor greets everyone on the train and tries to assess the situation. The passengers are all frightened and in disbelief that they’ve seen actual aliens. She does her best to calm everyone and asks if any one has seen anything else out of place during the day. Ryan mentions that he did in fact see a strange orby thing in the woods earlier in the day. They take the Doctor to the scene where the orb was and it is mysteriously missing. The Doctor begins to lose her strength and needs to rest, so Ryan takes the group back to the house to rest. After a quick nap, the Doctor awakes in a panic realizing that they have all been implanted with tiny DNA bombs in their necks. She reconfigured Ryan’s phone to track the tentacle monster that implanted the DNA bombs and the group sets off. A new scene opens on a dark night at a warehouse somewhere in the city. A man named Rahul is confronted by his nervous friend who wants to go to the police. Rahul darkly tells his friend to tell no one about their situation. He asks to be alone and his friend, though still very concerned, leaves him. Rahul begins to set up recording equipment and we finally get to see what he is protecting. He has taken that strange orb that Ryan found. Rahul is agitated and on edge, obviously anxious to get at whatever is inside the Hershey’s Kiss shaped space pod. The pod begins to glow and vibrate, cracking open to reveal a humanoid figure rising out of the mist. An armored creature steps towards Rahul, who ominously asks “where’s my sister?”. There is a brief confrontation between Rahul and the alien before the alien reaches out and crushes his head. The Doctor leads everyone to the warehouse where the armored alien and the tentacle monster have just killed Rahul. She confronts the alien and discovers his name is Tzim Shaw, a Stenza, who has been sent to Earth on a hunt to prove his worth to lead his people. She threatens Shaw but he escapes with his tentacle mosnter/tracking coil. While the group investigates the warehouse for information, the Doctor builds herself a new sonic “swiss army knife” screwdriver. Using the sonic she discovers who Shaw is hunting and they once again rush off to save the day. The big showdown is set to go down at a construction site where Karl, an awkward man from the train accident earlier, is working as a crane operator. Shaw has been sent to hunt Karl down and bring him back as a trophy. Shaw kills Karl’s co worker and begins to climb the crane to get to Karl. The doctor, Ryan and Yaz hijack another crane to try and reach Karl first. The crane stops just short of reaching Karl and the Doctor makes a brave leap as Shaw is dragging Karl away. She gets Shaw’s attention by showing him the transporter beacon from his ship that will leave him stranded on earth if she destroys it. Shaw attempts to escape again by setting off the DNA bombs. The Doctor then reveals that she implanted the DNA bombs into his tentacle monster that he absorbed. Shaw begins to melt away as he presses the beacon to take him home. Meanwhile, Graham and Grace take on the coil monster on their own. Grace climbs the tower and sends a shockwave of electricity through the monster, destroying it but accidentally killing her in the process. The episode ends with Grace’s touching funeral scene. Graham expresses how lucky he is to have a second chance at life since Grace nursed him back to health after cancer. Ryan finally learns to ride a bike, overcoming his dyspraxia. The Doctor has come up with a plan to find her TARDIS. She recruits Yaz, Graham and Ryan to help her set everything up. The countdown begins and the Doctor says her goodbyes. There’s a huge flash of light and suddenly she’s floating in space. To her horror she realizes that she has accidentally brought everyone along for the ride and they are slowly dying in space. The TARDIS is no where in sight. No planet, no TARDIS, no way out. Well, that was an episode. It wasn’t the best….but it wasn’t the worst either. For a first episode with the all new cast, I’m ok with it. It has the classic alien monster face off that most episodes start with. The story is a little jumbled and a little hurried. I found the pacing to be really rushed which affected the emotion of the story. They had to introduce an all new cast, give them a semblance of character development, or at least a defining trait, and make you care about them all in the space of one episode. It was a lot to take in and I don’t feel like they really did the new characters justice. I missed the instant connection that the other companions had with the Doctor in their first encounter. Rose was swept up in a whirlwind of exciting action, Martha stood her ground and didn’t take the Doctor’s sass, Donna swept the Doctor up into her own crazy whirlwind, and Amy Pond, Rory, Clara, and Bill Potts all had very memorable and likable first encounters. I didn’t feel that at all with any of the three companions in this first episode. There wasn’t a whole lot of meaningful interaction between the companions and the Doctor in this episode. It was very driven by the Stenza story line, which left little room for the characters to breath or laugh or settle into what’s going on. All the companions seemed to take the events of the episode very, very well. I don’t know exactly how I’d react if I found out a tooth faced alien monster was attacking the city and the strange woman who fell through a train car is also an alien, but is here to help but… I doubt I’d be sticking around for very long. I missed the slightly crazed, but mostly intrigued disbelief that most other companions always had when trying to keep up with the Doctor’s adventures. There was a little bit of it whenever Graham would question the situation out loud. I’m with Graham, you run away from aliens, not towards them. I was a bit thrown off that all the companions already knew each other before the Doctor came along. 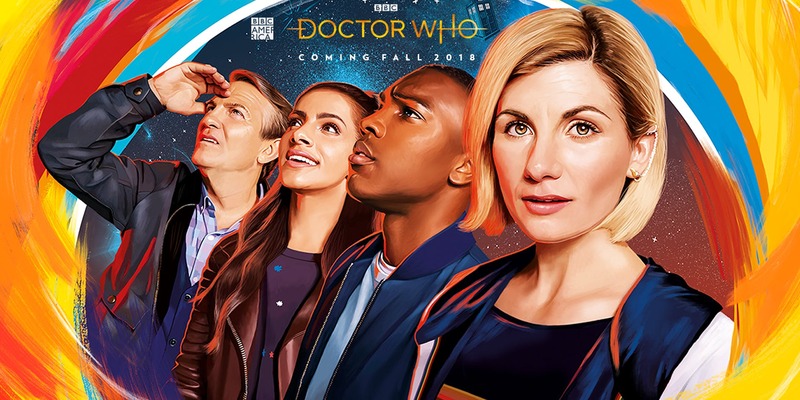 The trailer made it seem like the Doctor hand picked several strangers out of the crowd to be her new companions, but instead it seems like we get the family bundle. I think the step-grandson and step grandfather interactions between Graham and Ryan could be interesting. Maybe. Their introduction seemed pretty vanilla, ‘step-so and so’ isn’t my real family and I can’t accept them kind of stuff. Speaking of Graham’s character, I think Bradly Walsh is by far the shining gem of the episode. His acting is fantastic and I can see his character doing very well. It will be interesting to see where his character arc goes after his wife’s death (which felt a bit forced). Grace’s death scene also didn’t feel right. I didn’t like that story plot at all. You could see it coming the entire episode, but even as it was happening I kept thinking “really? This is how she’s going to die?” The rushed story pacing also didn’t really give our characters any room to grieve either. Ryan and Graham don’t seem too torn up at all after losing their loved family member in a freak accident. Besides the bland introduction of the companions, the other thing that caught me off guard was the humor. The humor is what really attracted me to Doctor Who in the first place. The snarky, quick witted, mischievous humor that the Doctor always possesses. My favorite episodes are the ones that can seamlessly blend edge of your seat action with a healthy layer of silly. I can be pretty picky about the humor in Doctor Who. It can get pretty campy and cheesy really quickly, and I found that this episode definitely leaned into that area. I absolutely love Jodie Whittaker in Broadchurch. I know for a fact that she has the acting chops to pull off dramatic, driven, fearless roles. Humorous though? It’s still waiting to be proven. She seemed always out of breath, or on the verge of a dementia episode which made most of the humor fall flat. The writing was fine, it was all in the delivery. This episode’s style of humor reminded me a lot of Matt Smith’s rambunctious energy combined with Peter Capaldi’s intensity. The humorous lines were missing their mark with me every time as Jodie spit out lines at breakneck speed throughout the whole episode. I am really hoping that she has some time to breath this next episode (is this an outer space joke?). Just as the writing style attempted to combine several Doctors into one, the episode was riddled with references to the Doctor’s past lives. Little Easter Eggs and hints flew everywhere, and several jokes mirrored older story lines from previous seasons. The 13th doctor seems to have inherited 12’s forgetful memory problems, 11’s childlike sense of humor, 10’s need to do the greater good, and 9’s call to action. Not to mention 13’s outfit is a direct mash up of the styles of several doctors at once. It’s as if the show was trying desperately to prove that this doctor still fits within the Doctor Who world. They laid it on pretty thick so hopefully they get it all out of their system soon and give 13 some unique and memorable personality traits. I don’t know how much longer I can watch them rehash every way the new Doctor is still like all the previous Doctors. I am glad that they didn’t rely on her gender change to drive the plot of the episode. There were only a couple references to the change that didn’t linger too long on the fact. I can see Whittaker handling the comedy aspect of the show really well. This first episode felt a bit like the whole cast was finding their footing, but as soon as they get the hang of things, the writing and the acting will mesh more smoothly and the humor will hit it’s marks. She had some great lines in this first episodes that I really enjoyed and I look forward to seeing more. Whittaker also handled the action sequences with ease as well. She looked like a natural while she was making her screw driver and taking on Tzim Shaw. Oh Tzim Shaw… your armor is cool but your teeth are not. Doctor Who can be so hit and miss with their alien monsters. And on a scale of Abzorbaloff to Weeping Angel Mr. Tzim definitely tips more towards Abzorbaloff. Those teeth though. I think I got spoiled by all the amazing psychological monsters of the Moffat era. Hopefully the writers find some interesting concepts to bring to life. The best villains are always the ones that have something important to say. I also had a bit of a hard time getting into the story itself in this first episode. I was excited for the ‘debut’ appearance of 13. Maybe a more detailed peek into her first moments after regeneration. But it seems like the few scenes in the trailer and the final moments of season 10 are all we get. The 12th Doctor regenerates inside the TARDIS, causing it to begin to break apart, leaving a freshly born 13 rudely ejected into a free fall to earth’s surface. No explanation to how 13 survives a giant fall through a train car or why she’s on earth, or how she knows how to defeat the tentacly beast and the tooth face monster. I really missed watching the freshly regenerated Doctor figure out how everything works in those first crucial moments. A regeneration scene can be so memorable if done right. This episode skips over that completely. In fact, 13 seems to be a crime fighting, mystery solving machine right from the get go. She is unfazed by falling out of the sky, into a train, and picks herself right up and begins fighting off the mysterious tentacle monster without pausing for breath. I thought for a brief second that we had missed some chunk of time between regeneration and this scene. I thought maybe 13 had been hunting this alien and literally tried to get the drop on it, but apparently she just happened to fall into the situation seconds after the end of season 10. Maybe we’ll get this Doctor’s story piece by piece over the next few episodes of the season. Next episode has the promise of action and suspense right from the get go. Everyone trapped in space, no TARDIS in sight, no air or planet, or anything really. 13 is really going to have to do some quick thinking to get everyone out of this one alive. I am truly excited for next week’s episode. I’m ready for some backstory, character growth, and another exciting adventure with the Doctor. As much as I wanted to love this episode and sing its praises like every other article you’ll read out there, I’m not going to hide my thoughts. As an overall episode of Doctor Who this episode was….fine. Not spectacular, not emotionally charged, nothing really to write home about. I missed that spark that first episodes can so often bring. The cast and crew made some bold choices and I think in the long run it’ll pay off. I have the feeling that this season will be a bit of a slow burn. This episode had a lot to live up to and so far… I can see a potential. If the writer’s find meaningful stories to tell and give us characters that have more than one facet, I feel like this season might be the one to breath life back into the series. I am waiting to see that fire that Doctor Who had with Eccleston, Tennant, and Smith. I loved those stories, and those Doctors. Even Capaldi had his moments there with Bill Potts and the Cybermen or Clara and the Daleks. I am excited to see what is to come for Whittaker and her new companions as we get to explore a new set of stories.